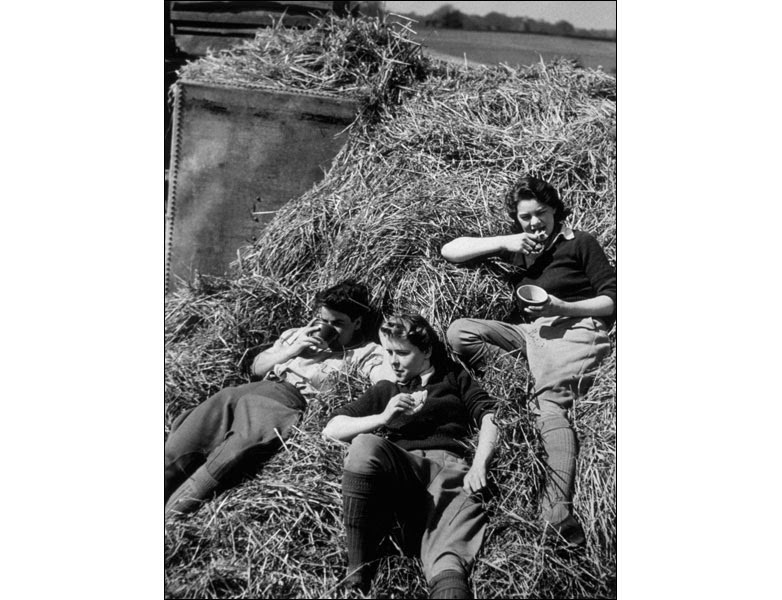 The Women's Land Army was set up in June 1939 to help on farms, increase the amount of food grown in Britain and replace male agricultural workers, who were away fighting the war. At its peak in 1943, there were 80,000 Land Girls who carried out tasks such as hoeing, ploughing, lifting potatoes, lambing and looking after poultry. Lady farmers with great 40s fashion (johdpurs! knee-highs! waves!) enter the haystack Pie Enjoyment Zone with English savory pies. What more could you want? I would love to read a book about these women. Can i please live in this photo? I think we need a revival of the American Women's Land Army. I know, right?! This photo is basically my dream-fantasy world. By the way, Em. I have a pair of breeches, cira 1969 or 1970 in my collection. I have not worn them since the late 70's. They are not as "puffy" as these, but they are the old style with a little fluff in the hips.If they fit you, they're yours.